He is an icon in the world of darts! 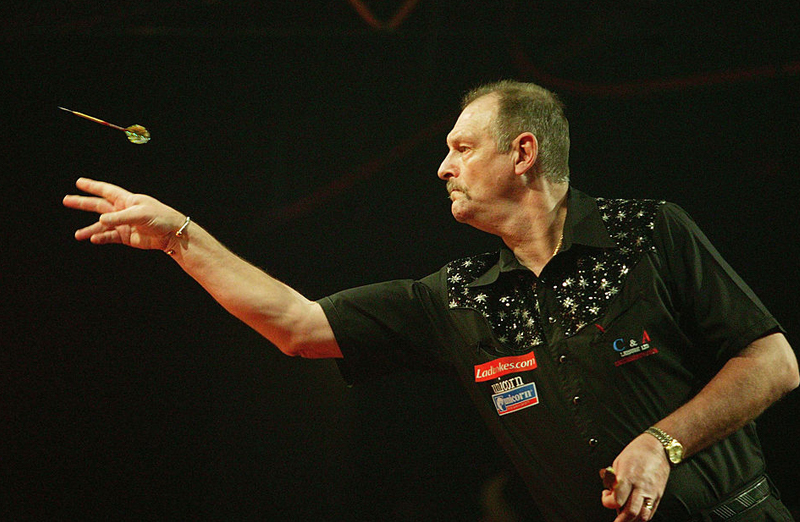 Bob Anderson is a World Champion, a darting ambassador and one of the true greats of the sport. It has been quite a journey over the last 30 years or so and even now, at the age of 69, he is still in demand on the popular exhibition circuit. 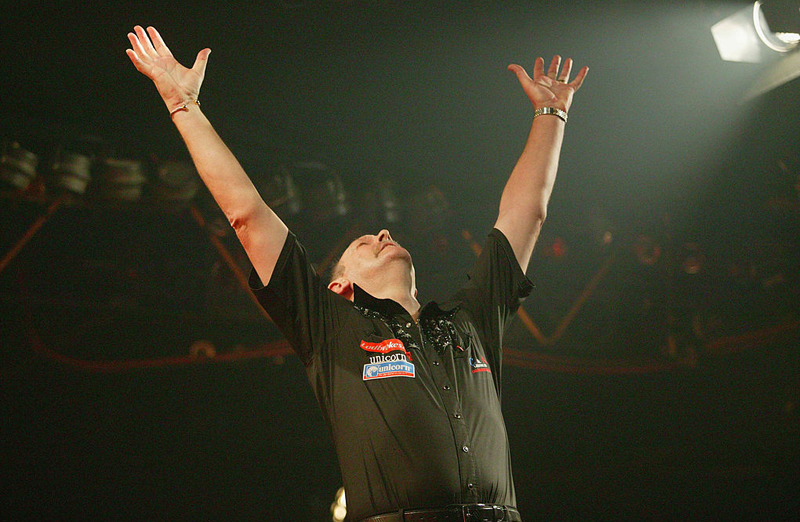 “No regrets,” said Anderson…..it is a fitting motto for a darting legend. And after retiring from the PDC circuit, he is still one of the most recognisable faces in the sport and Anderson certainly isn’t ready to throw away the ‘arrers’! His World Championship crown came in 1988 but his last big triumph came in 2008 when he won the League of Legends tournament. And more recently he has been involved in producing a Unicorn-sponsored special 20-part video series for the Videojug and Unicorn websites on how to get started in darts, as he continues to put back into the sport which has been good to him over the years. On the exhibition circuit, he is out on the road with fellow legends Lowe and Bristow. But there’ll be no tempting him back to the pro circuit. “People are always telling me that I could go back to the PDC and compete but no….it’s not for me now. I am enjoying what I am doing too much and the endless travelling is one of the main reasons that I gave it all up in the first place,” he said. ‘The Limestone Cowboy’ ended his competitive career in the PDC back in 2008 and it was some journey for one of darts great entertainers. It really was an incredible achievement, when you look at all the big name stars who have recently lost their places in the top 32 in the world…..and to stay in the elite over three decades speaks volumes for Anderson. Anderson of course took part and won the now defunct League of Legends in 2008, which was screened on Setanta Sports. He beat his old rival Keith Deller in the final. The tournament also featured the likes of Bobby George, John Lowe, Eric Bristow, Cliff Lazarenko, Dave Whitcombe and Peter Evison. Anderson has enjoyed an amazing link-up with Unicorn, going back over 20 years. 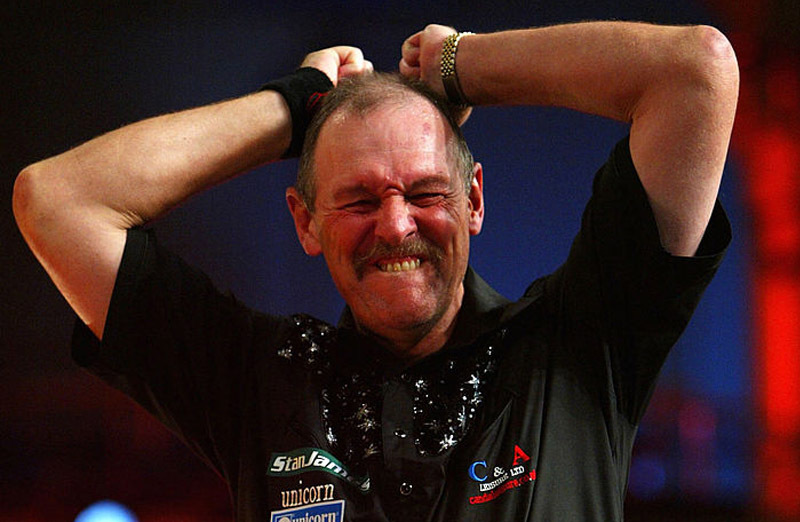 Only John Lowe has been sponsored by darts brand leader longer than ‘The Limestone Cowboy’. Of course, Anderson is a fully paid-up member of the most exclusive club in darts. He is one of the chosen few to be crowned World Champion. 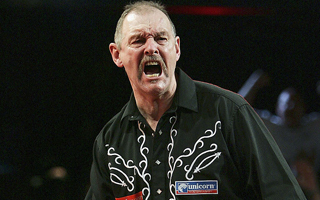 In 1988 he tasted the glory, beating fellow Team Unicorn star John Lowe at The Lakeside. In that final, he beat Lowe by 6 sets to 4 with a 92.7 average and won £16,000…..a far cry from the £200,000 that 2011 PDC World Champion Adrian Lewis collected….how times have changed! And remember Anderson made history by winning the World Masters three years running in the 1980s….a fantastic achievement. He beat Bob Sinnaeve to win his first ‘Masters’ in 1986 and then followed that by defeating Lowe in the finals of 1987 and 1988. During that golden era, he was World No.1 for three-and-a-half years, winning every tournament around the globe, including the old style World Matchplay and he won the World Pairs twice….and Anderson has always displayed the class and determination to mix it with the very best on the biggest stages of all. He continued to take on and beat the best and appeared in every big TV tournament year-in, year-out, until his retirement from the professional game. That is a measure of the man – a player who never lost the competitive edge. He puts down captaining England in 1992 as one of his proudest moments and he won those World Pairs titles with Lowe and Phil Taylor. More recently of course, before he walked away from competitive darts, Anderson reached the semi-finals of the PDC World Championship at the Circus Tavern in successive years. He is recognised all over the world and has always been one of the most popular players with darts fans around the globe. 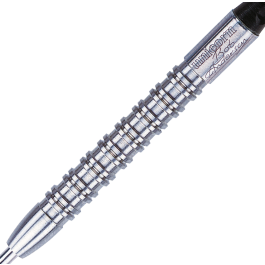 Incredibly, the long road to the very top started in 1954, when aged just seven, Bob hit his first 180 using brass and feather darts! But it could all have been so different. As a teenager, he was a British Champion athlete. The javelin was his chosen weapon then and he was invited to train for the Mexico Olympics before he broke his throwing arm and his athletics career was brought to an abrupt end in 1968. Anderson was also a good quality footballer, before a broken leg cut short any ideas he had of making it as a professional. Injuries have followed Anderson around. In 1990, a chronic back problem nearly put pay to his reign in darts. Again he was forced to have more surgery to correct the problem. “I don’t think there is anywhere else for them to operate,” he joked. But he was wrong! In 2010, Anderson was forced to undergo more surgery – having an operation to rebuild a dodgy knee. A true darting gentleman, Anderson was also involved in arguably the most bizarre ‘walk-on’ in the history of the game. In 1994, ‘The Limestone Cowboy’ was escorted to the stage at the Circus Tavern in Purfleet, during the World Championships, by a real horse! Married to Sally, Bob’s other great passion is golf. He plays off a 9 handicap, while he also enjoys a spot of fishing. And we all remember Bob’s trademark reaction to a magical maximum, which will always be synonymous with ‘The Limestone Cowboy’…..the curl of the lip and the index finger aimed at the board, like a gun. In his professional career, he never gave up….he loved fighting and winning lost causes….he always trusted in his own ability. 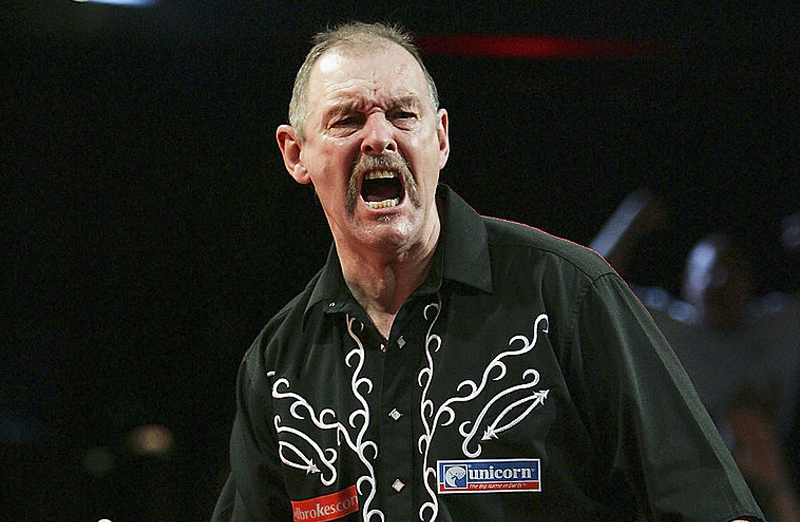 Bob Anderson – a real darting giant.